What could link safer streets, more bees and good food? Here’s a blog on sustainable arboriculture as not practised by Brisbane City Council. Let’s start with an end product before making the case to ‘grow me instead’. Dulce de Tamarindo is based on sour and tangy tamarind pulp which makes a soft and chewy snack combining sweet, sour and peppery flavours. 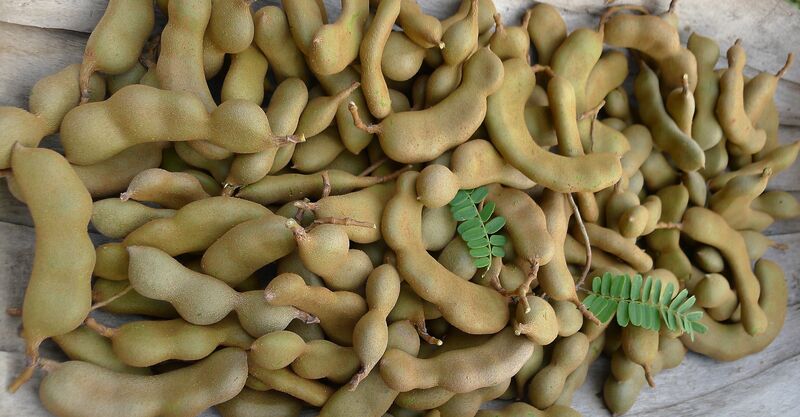 The tamarind tree (Tamarindus indicus) originates from tropical Africa. Grown worldwide in tropical and subtropical regions, their durable hardwood is valued for carpentry. Tamarinds have few pests, they’re drought tolerant, storm-resistant, non-invasive and non-suckering. Saplings grow at a moderate rate, forming attractive, long lived shade trees. In short, Tamarinds are ideal street and park trees for cooling Queensland’s coastal cities. In a very rare fit of common-sense and good planning, Brisbane City Council planted Tamarind trees around town about fifteen to twenty years ago. There are also older specimens said to be planted in the 1920’s by migrants. Council has since stopped planting Tamarinds, but the younger trees are now cropping in Bayside Brisbane, and yesterday I made Dulce de Tamarindo from some locally gathered pods. To make Dulce de Tamarindo you first have to prepare tamarind paste. Ladle some pods and juice into the centre of the tea towel, gather the corners, and gradually wring the paste out into the bowl. When the paste stops flowing, discard the waste and repeat. The waste composts quickly. Tamarind paste can be frozen for later use. Pour 4 cups of Tamarind paste into a large saucepan, gradually bring to the boil. Stir in 2 cups of raw sugar, half a level teaspoonful of salt and one level teaspoonful of chilli powder. Pour into a cup cake tray (smaller cake sizes make smaller, bite-sized sweets) and allow to cool and set (You may find lining the trays with cup cake holders may help the next stage). When the contents have set, remove sweets from the tray and dust with castor sugar. Traditionally bite sized pieces are moulded and rolled into balls and coated with castor sugar. Store in a cool place. Tamarind would be a perfect replacement tree for the damaging African Tulip trees (Spathodea campanulata) currently littering Brisbane streets. It’s disappointing that councils spend rates on maintaining weed tree species like the African tulip tree. It invades bushland and vigorous, suckering roots damage underground services like water, sewage and gas pipes. African tulip tree is notorious for poisoning native bees with toxic pollen. The flowers collect dew and rain which mixes with nectar forming a noxious brew. In their native habitat nectar is a lure for birds. But where native stingless bees (Tetragonula, syn. Trigona) occur they are either killed by the pollen or intoxicated after drinking the solution and drown. African tulip tree wood is brittle, so it must never be grown in playgrounds or as a street tree. They readily shed limbs on roads in a storm. They are the first tree to collapse across streets in a cyclone. Few trees are as risky to grow in a city than the African tulip tree. Weeds Australia describes African tulip tree as being invasive in the tropics, however, the specimen planted in Sydney Botanic Gardens (warm temperate suckered and set viable seed. This tree is an invasive weedy in frost free regions, that is, wherever it can grow outdoors. If Council is being honest about wanting to reduce wasting money on city repairs and litigation as a result of their trees wrecking our built and natural environment, maybe it’s time they replaced African tulip trees with tamarinds. Sustainable arboriculture is holistic, it’s about creating a beneficial, cost effective legacy. M. Rawle: I didn’t realise that they killed bees – wont be planting one of them! M. Kornbrekke: I used to love popping the seed pods as a kid. Won’t be doing that anymore, I didn’t realise it was a weed, let alone a Bee killer. G. Howard: Didn’t realise they killed bees. D. Smith: used to love these trees as a kid, planted them around the property, then a little wind came and blew them all down. Not the greatest root system. A. Cooke: Anyone know how I can kill mine? C. Komp: well I am definitely glad I got rid of mine years ago!!! It’s roots are terrible, it suckers and makes a mess. I didn’t know about the bees either. Definitely not one for the back yard! D. Weber: Thank you Jerry for this info. They are not very attractive trees anyway. I will let the people in the Bushcare Group to know to look out for it…….and DESTROY!!!! P. Venables: used them (African Tulip tree) as water pistols as a kid. First tree to come down in a cyclone. M. Carra: There are a couple of streets on the (Brisbane) southside where the council is maintaining existing plantings of Tamarind trees. There is Dornoch Terrace at Highgate Hill where I have noticed recent plantings of Tamarind trees to replace older trees. There is also Ekibin Road through Annerley which has old street tree plantings of Tamarinds. They are a beautiful tree and should be used more often. V. Bland: I have just seen the new plantings of Tamarinds down the road on Dornoch Terrace. How exciting. These are historical Tamarinds. Planted in the 1920’s by immigrants I believe. When they fruit we get lots of Indian, Sri Lankan and Asian folk gathering seed pods from them (we gather as well) I have found out that they also use the new leaves in stir fry and curry for tamarind tang and as a green vege. The one outside our garden is big! My husbands grandparents house in redcliffe has tamarinds as street trees. Unsure if this was the councils doing or his grandparents. Every year when the pods are ready for picking carloads of people turn up and pick them for their Asian cooking. Agree that the African tulip shouldn’t be used as a street /park tree. Hopefully the council is no longer planting these and are now faced with removal of existing tulip trees. How lovely to hear people both recognise and use this precious productive tree. Thanks LyleT, handy to know a bit of history! Umbrella trees are on the councils list of weeds, but they are still growing on council land – there is one in a carpark on the wynnum waterfront. Seems a bit strange. Great blog Jerry, thank you for sharing. I had no idea of the dangers of the African Tulip Tree. How do we find out where Tamarinds are growing in our local area or where to buy the plants? (I’m at Strathpine). I already have footpath trees, Tibouchinas, or I would plant these myself. About to plant a tamarind on Norfolk Island – really enjoyed the discussion!!! Very Informative article. Replacing (KILLING!) My One and only Tulip Tree is now on the list…. I managed to germinate One very Vigorously thriving T Tamarind Tree From pulp (Juice ) to make Tom yum Goong soup And simply fished the odd Accidental seed that Occurred. MY QUESTION WAS…..WILL MY (now 60cm tall) survive and grow well on the Central Coast of NSW ???…………THANKS. African tulip trees are also producing yellow nectar that ruins your cars paint. Brisbane City council refuses to remove the tree because it is healthy. We were prepared to replace it with some other tree, but are not allowed to do so.